My mind rushes back to 2006 when I had just bought my Hero (Honda) Karizma. Riding out to Lavasa back then, still, the weekend haunts for sports riders in Pune, being astride a bike with anything less than 200cc would’ve been considered sacrilege. 150cc? Forget about it. Those were too impotent. Twelve years on, the road hasn’t changed much, and I find myself riding up and down the winding tarmac along with my colleague Karan during our shoot. But we’re on a pair of 150cc motorcycles (well 155cc and 160cc actually), and still I’m having a blast! What has happened? Have I become so old that I actually find these smaller capacity bikes enjoyable? While there’s no denying that nothing can halt the unstoppable march of time, this segment, once almost relegated to “power commuters”, is now nearly rife with bikes that deliver almost as much excitement as some of the sportiest one from a decade ago. A perfect case in point is the Suzuki Gixxer - a giant-killer as far as we’re concerned, which is now being seriously challenged by the new kid on the block - the TVS Apache RTR 160 4V. If you haven’t been paying attention to what’s been going on in the Indian two-wheeler sphere for the past few months, you might find it quite surprising that the Apache 160 - a name that was often ignored in such comparisons, is suddenly going toe-to-toe with our favourite bike in this segment. But TVS has pulled out all the stops with this new Apache, which borrows a whole lot from its larger sibling, the RTR 200, starting with the design. Pretty much all the panels have been carried over from the 200, including the chunky tank with its offset fuel filler cap. Bright colours and the minimalist stickers lend this RTR160 a larger-than-it-is appearance. The only visual differences are a single seat (in place of a split one), a slightly redesigned tail panel and a one-piece handlebar (rather than raised clip-ons). It is quite a good looking bike, and we think it’s a lot more striking than the Gixxer. The Gixxer, although decent looking, has never been much of a head-turner. And in the four years since its launch, it hasn’t really received any design changes barring paint schemes and sticker jobs. If we’re being honest, the recent sticker jobs, especially on this red and black SP version that we’ve got here, look quite tacky, and we believe it still looks the best in its MotoGP-inspired blue livery. One aspect of design that the Gixxer has going for itself is the instrument cluster. It’s an all-digital unit and packs all the information you’ll ever need. The RTR160’s too has all-digital instrumentation, borrowed from the 200. But for this carburetted version, it’s been stripped of a gear position indicator - not cool TVS, not cool! One of the reasons why we’ve loved the Gixxer so much ever since we rode it all those years ago is the fact that apart from its sporting intentions, it has been a bike that you can comfortably use on a regular basis. With a seat height of 780mm, you’re sitting fairly low in the motorcycle, and the one-piece seat itself is fairly comfortable. The low and not-so-rear set footpegs provide a comfortable perch while the wide handlebar provides plenty of leverage to throw the bike around in traffic. The Apache, on the other hand, has a slightly higher seat height of 800mm. The footpegs are set quite high as well, though thankfully they aren’t too rear set. There is a slight lean forward towards the handlebars, so the overall posture definitely feels sportier than the Gixxer’s. The riding position isn’t committed enough to feel like a problem during city commuting or even long distances on the highway, and the seat is quite comfortable too. But those who prefer a more conventional posture will definitely be happier with the Gixxer. This Apache packs a 159.7cc single-cylinder oil-cooled motor that gets a 4-valve head. With 16.5PS of power (for the carburetted version) and 14.8Nm of torque, not only is it more powerful compared to its predecessor, it’s the most powerful bike in its category. And it shows it too. Despite a kerb weight of 145kg, which is 10kg heavier than the Suzuki, it manages to get from zero to 60kmph in 5.04 seconds - segment leading performance. The Gixxer, on the other hand, almost pales in comparison to the Apache. It puts out 14.8PS and 14Nm, which even with a weight advantage, propels it to 60kmph in 5.55 seconds. But the Gixxer has never been about outright performance numbers. Its hallmark has been a fun and exciting riding experience, which is reflected in the motor as well. Where the Apache’s motor almost calms you down with it’s refinement levels and linear power delivery (a far cry from the Apaches of old), the Gixxer’s grunty mid-range has you itching to open the throttle more. Thanks to this strong mid-range and slightly shorter gearing as compared to the TVS, the Suzuki manages quicker in-gear acceleration times. In 3rd gear, the Gixxer gets from 30 to 70kmph in 6.56 seconds (vs 6.87 seconds for the Apache), and that gap only gets larger in 4th gear, where the Gixxer does the 40-80kmph dash in 8.46 seconds, while the RTR manages the same in 9.02 seconds. So in outright performance, the Apache’s motor has a distinct advantage, despite losing out a bit when it comes to in-gear acceleration. It also packs in better performance in the top end when compared to the Gixxer. But what about when it comes to everyday usability? Well, both motors are quite tractable, but it’s the quicker-revving RTR which performs slightly better here. It can pull from as low as 20kmph in 4th gear without any hint of lugging. The Gixxer can only manage the same from a little under 30kmph. But when it comes to the daily commute, you’ll certainly appreciate the almost completely vibe-free experience this new Apache provides. Sure, there is a very mild buzz which can be felt in the footpegs at 6000rpm, and a bit of resonance which can be felt in the tank and centre panels at about 9000rpm. But you’ll feel none of this at the handlebars. That’s not to say that the Gixxer is a majorly vibey experience in any way - it’s actually one of the smoothest engines in its class, but the moment you ride it back to back with the Apache, it starts to feel a little rough around the edges. Here’s where things get interesting. We’ve always revered the Gixxer’s handling prowess, which is good enough to punch above its class. Absolutely neutral, planted and precise - this little Suzuki will put a smile on your face everytime you show it some corners, no matter how jaded a biker you are. The handlebars are wide, giving you plenty of leverage and the fat 140-section rear tyre provides a lot of confidence when leaned over. The Apache, on the other hand, is a very different experience in the corners. TVS bills this bike as “race-derived” and it really shows in the way it handles. It turns in rather quickly, though thankfully not to the point of feeling twitchy - a serious concern on the earlier RTR 160, and to a certain extent, on the RTR 200 as well. The quick steering is thanks to its aggressive geometry, higher centre of gravity and skinnier rubber, at both the front (90/90-17) and back (130/70-17). The TVS Remora tyres are quite good though, and through the bends, they allow you to carry a fair bit of lean angle without breaking a sweat. And the higher set footpegs assist in this as well, ensuring that you won’t ground the pegs even when cranked over quite a bit to either side. 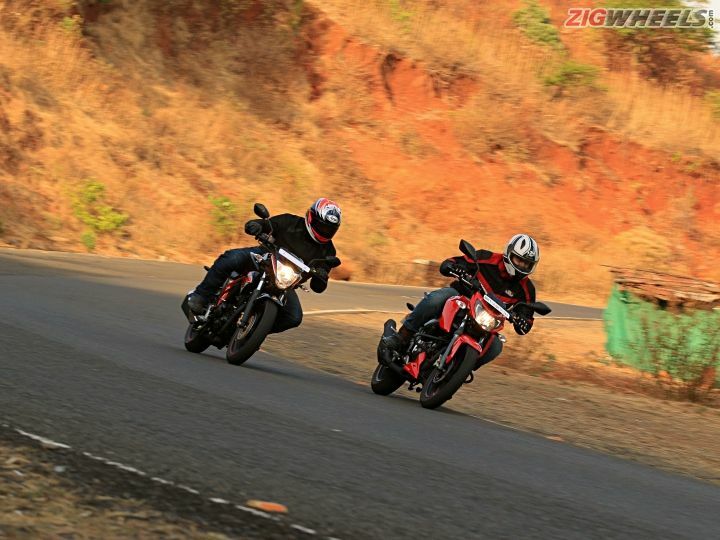 The Apache ideally requires the measured hand of an expert to get the most out of it, while the Gixxer will delight just about anyone, no matter the rider’s skill level. But here, the Apache’s suspension setup just impresses. Sure, the suspension is on the firmer side, so you can feel undulations on the road surface. But none of them upset the bike one bit even when you’re fully leaned over. The suspension has been tuned by Showa, and you can really feel the sophistication in the damping. Sharp bumps are certainly felt, but none of them is jarring or transfers the jolt to either rider or pillion. And there’s barely any suspension movement past the initial bump, as it is quick to settle. In comparison, the Gixxer feels almost too stiff, especially at the rear. Smaller bumps are managed well, but the larger ones can feel really harsh. Thankfully though, it doesn’t bob about on continuous bumps, and settles fairly easily, though your back won’t be thanking you after riding over some bad roads. Another area where the Gixxer has always felt lacking is brake feel. The front brake lever is quite spongy, with a lot of travel before braking starts. Thankfully though, braking distances are perfectly acceptable, with the little Suzuki pulling to a halt from 80kmph in 36.90 metres. But in this department, the Apache feels almost disappointing. Not only is there little feel from the brake lever, even bite is quite lacking. Nowhere does it feel dangerous when braking hard, but it has the longest braking distances in its class, stopping from 80kmph in 41.51 metres. Neither bike offers ABS at the moment, but from what we understand, both TVS and Suzuki are planning on launching ABS variants of these two in the near future. The Gixxer ekes out genuinely good fuel efficiency figures, returning 47.2kmpl in the city and 50.7kmpl on the highway. But it’s the RTR’s higher tractability and slightly taller gearing that pays off when it comes to stretching the most out of each litre of petrol. Its carburetted version manages 50.9kmpl in the city and 56.1kmpl on the highway - class leading here too. In fact, this Apache is the most fuel efficient bike in this segment, with the exception of the Suzuki Gixxer SF FI. Suzuki will be introducing a fuel injected version of the naked Gixxer in the near future, so we do expect that bike to outdo the Apache in this department. But TVS already has an FI version of the RTR 160, though we’re yet to test it. So between the fuel-injected bikes, it could be anybody’s game. In this category of motorcycles, the Suzuki Gixxer has been the bike of our choice so far. It’s genuinely fun to ride the motorcycle that won’t bore you even if all you’re accustomed to litre-class fare. And it’s decent value too, at Rs 80,929 (ex-showroom Delhi) for the rear disc variant. TVS developed the Apache RTR 160 4V with the aim of making it an upstart in this segment, and it is to a large extent. It offers segment-leading performance without compromising on any of the day-to-day practicality aspects - and that’s literally what this segment is supposed to be about. Sure, it’s not without its flaws. The brakes, for example, leave a lot of scope for improvement. But these flaws aren’t deal breakers. And sure, at Rs 84,490 (ex-showroom Delhi) for the carburetted rear disc variant, it’s a bit more expensive than the Gixxer. But then its offering better performance, slightly better refinement and significantly better suspension feel. If you fancy yourself the Gixxer, then get one by all means - you won’t be disappointed. But if you want the new segment king, then it has to be the Apache RTR 160 4V.